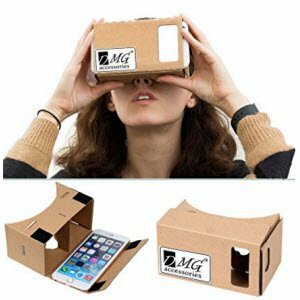 Amazon offering DMG VR Google Cardboard Kit with Straps 3D Virtual Reality Compatible Rs.149 only. GOOGLE CARDBOARD is the primary experience version of 3D VR Glasses.It made from the AAA grade corrugated paper which is the strongest material.Our product is the highest quality for this price in the market. HAVING ADVANCED GOOGLE CARDBOARD according to the advice from customers and tested it over 80 times. IN ORDER TO EXPERIENCE HIGH QUALITY 3D FEELING,you’d better use high resolusion smartphones. Experience a truly stunning, engrossing VR experience with cinematic HD visuals from your smart phone’s screen using the included biconvex lenses offering a 37 mm focal length for the best visuals! THE PERFECT SOLUTION for Virtual Reality on a budget!Box-style package with good portability, easily take anywhere .